An off-beat walking holiday to the Caucasus that explores Armenia's spectacular mountain scenery, unspoilt villages and fascinating medieval monasteries. From the twisted rock formations of the Garni Gorge to high-altitude Lake Sevan and the magnificent UNESCO World Heritage Geghard Monastery, this beautiful country won't fail to impress. The trip starts today in the Armenian capital Yerevan, a busy and cosmopolitan city, looking to the future but deeply rooted in its past. Find wide tree-lined boulevards, grand 19th century buildings and several museums as well as many street-side cafes, perfect for sampling a strong Armenian coffee while people watching. Today we will discover the sights of Yerevan a city tour with our trip leader. Starting from Victory Park, we take in a panoramic view of the city at the Mother Armenia monument. On a clear day there are splendid views across the Ararat Plain to the silhouette of Turkey's Mount Ararat (5,165m), the legendary resting place of Noah's Ark, once part of 'Greater Armenia' and to many Armenians still symbolic of a glorious past. We then continue on to Republic Square, the Opera house and the Cascade. Driving along Baghramyan Avenue we pass by the Parliament building, the Palace of the President, and the National Academy of Sciences. We will stop to visit the Genocide Memorial Complex, dedicated to the memory of the 1.5 million Armenians who perished in the first genocide of the 20th century at the hands of the Turkish government. Our final destination is the Matenadaran Library, which hosts the biggest collection of medieval Armenian manuscripts. Leaving Yerevan behind this morning, we drive to the village of Bujakan from where we begin the first walk of the holiday, to the ruined 10th century monastery of Neghuts. Ascending to the ridge of Mount Teghenis, on a clear day we should have a breathtaking view of the highest mountain in Armenia, Mount Aragats (4,090m) as well as the distinct dormant volcanic cone of Mount Ararat in neighbouring Turkey. We plan to stop for a picnic lunch near the monastery ruins before descending to the village of Arzakan. From here we drive to our hotel for the night by the shores of Lake Sevan. This beautiful lake is situated at an altitude of approximately 2,000 metres and is the largest lake in the Caucasus. On the peaceful Sevan Peninsula we visit Sevanavank Monastery which dates back to the 9th century and from where we can enjoy a wonderful view of the lake. Today's 10 kilometre walk is graded Moderate and expected to take approximately four hours with a total ascent of 450 metres and descent of 550 metres. In the morning it's a short drive to the small village of Artanish from where we plan to hike to the top of Mt Artanish (2,461m), a steady climb of around 400 metres. All along the way there are beautiful views of Lake Sevan and the surrounding wild and empty landscapes. Later, we head south by bus to the village of Hermon, making a couple of stops along the way. The first will be at the village of Noratus where there is a vast cemetery known for its collection of unique and fascinating carved stone crosses known as khachkars. Covered by colourful mosses and lichen, the earliest date from medieval times. We then continue driving along an ancient Armenian silk route to the Selim Pass Caravanserai, a stopping-off point for caravan riders and their pack animals carrying good from the Orient to Europe. Today's seven kilometre walk is graded Moderate and is expected to take approximately two hours with a total ascent and descent of 400m. In the morning we drive to the village of Artabuynk, the starting point for our hike to the fortress of Smbataberd. Spectacularly located on the crest of a ridge between the villages of Artabuynk and Yeghegis, Smbataberd. is guarded by steep cliffs on three of its sides. We will explore some of the large ramparts and towers which are still relatively intact. The fort's origins date back to the 5th century although much of the fortifications date from the 9th and 10th centuries. Our walk continues with great views of the Yeghegis valley, to the medieval monastery of Tsakhats Kar which we will visit before continuing to our hike's end at Yeghegis village. From here it's around a two-and-a-half hour drive to Goris where we spend the next two nights. Today's 13 kilometre grade walk is graded Moderate and is expected to take approximately five hours with a total ascent of 450 metres and descent of 500 metres. From Goris it's a short drive to Halidzor from where we take a ride on the breathtaking \ Wings of Tatev\ cable car linking Halidzor with Tatev Monastery. Constructed in 2010, this is the longest (5.7 kilometres) non-stop double track cable car in the world. After our cable car journey we start walking along a route known as the Serpentine Road which leads us up to the 9th century monastery of Tatev, fabulously located on a plateau at the edge of the Vorotan canyon. With a depth of 800 metres, this is the deepest canyon in Armenia, carved out by the fast flowing waters of the Vorotan river. In the 10th and 11 centuries, Tatev was one of the most important Armenian medieval universities. After spending some time at the monastery, we walk down to the bottom of the valley, enjoying superb views all the while. In the bottom of the canyon we stop to see the Devil's Bridge. This amazing geological monument is a natural bridge some 30 metres long and 50 metres wide which spans the Vorotan River and has been formed from limestone travertine deposits built up from natural hot water springs. After our hike we drive to the nearby settlement of Khndzoresk and walk through Old Khndzoresk, a large troglodyte village located on both sides of a deep canyon. Now abandoned, it was populated until the mid-20th century; we wander around some of the cave houses - some of them several floors high. Today's seven kilometre walk is graded easy and is expected to take approximately two-and-a-half hours with a total ascent of 100 metres and descent of 500 metres. This morning we take a short walk to the ancient standing stones of Karahunge - an ancient place of worship dating back 7,500 years; it's now thought it was once an observatory. We then drive to the snowy mountain peaks of the Vayots Dzor Province. This is an area of outstanding natural beauty, with flowing rivers, waterfalls and wild flowers. We visit the stunning 13th century Noravank Monastery, perched on the cliffs overlooking a magnificent gorge. We break for a picnic lunch and then continue to walk through the plains of Ararat with beautiful views of the biblical Mount Ararat. 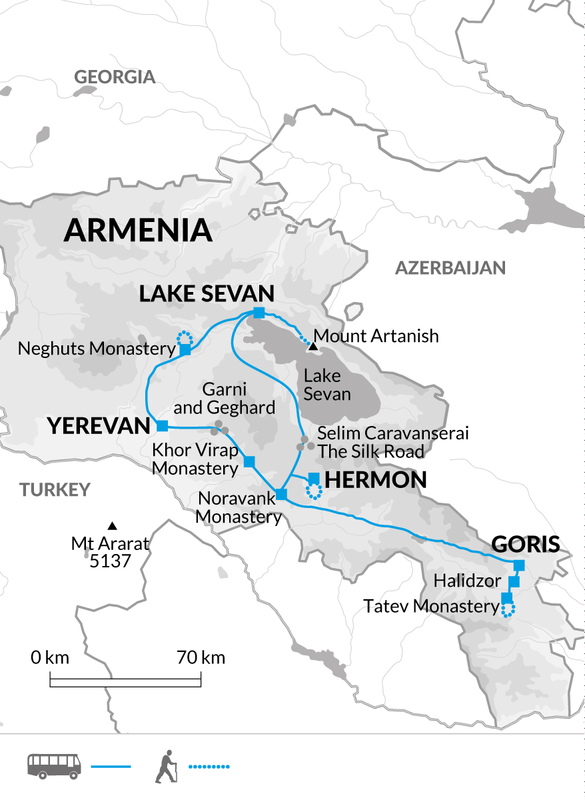 In the afternoon our journey to Yerevan continues, stopping along our way to explore Khor Virab Monastery complex. This was the place of St. Gregory's imprisonment and today it is an important place of pilgrimage. Today's one-and-a-half kilometre walk is graded Easy and is expected to take approximately an hour. This morning we drive out of the city to Garni village from where we start hiking through a canyon to the impressive 1st Century AD Garni temple. This Greco-Roman colonnaded temple is believed to have been built as a temple to the sun god Mihr. Apart from the ruins of the royal complex, you will also see a bathhouse with an interesting mosaic. We then walk down through the Garni gorge to see the immense volcanic basalt formations known as the 'symphony of stones'. From here it's a short drive to Geghard monastery - a UNESCO World Heritage Site. The complex, surrounded by the towering cliffs of the Azat Valley, contains a number of churches and tombs, most of them cut into the rock, which are examples of the very best Armenian medieval architecture. Today's three kilometre walk is graded Easy and is expected to take approximately one-and-a-half hours with a total ascent of 120 metres and descent of 100 metres. The trip ends after breakfast this morning in Yerevan. Due to the fact that Armenia is on a high landlocked plateau the temperature extremes are pronounced: winters are cold and summers can be very hot, spring and autumn are widely regarded as the best times to visit. Take light and comfortable clothing that can be layered according to the temperature. Pack a waterproof jacket and trousers, fleece jacket, comfortable walking trousers, shorts, t-shirts and a sunhat. Please be aware that temperatures can change dramatically at altitude and at night. In remote parts of Armenia you should avoid shorts and vest tops; long trousers or skirts are ideal (your Leader will be able to advise you on appropriate dress in different locations). A headscarf is essential for visiting churches and mosques. We recommend you bring lightweight walking boots with ankle support, make sure that your boots are worn-in and comfortable before the start of the trip. Also trainers or sandals for relaxing and general wear. We suggest that on international flights you either carry your walking boots in your hand luggage or wear them - should your luggage be lost or delayed, your own boots are the one thing that will be irreplaceable. You will need a water bottle (preferably 2 litres), torch, insect repellent, sunglasses and high factor sun cream. You may like to bring trekking poles if you normally use them. At your discretion you might also consider tipping your Leader in appreciation of the efficiency and service you receive. Although entirely voluntary, tipping is a recognised part of life in this region of the world. Some local staff will look to members of the group for personal recognition of particular services provided. Accordingly, you should allow US$ 20. In order to make things easier for you, theLeader may organise a group's tips kitty and if this is the case, they will account for it throughout the tour. We recommend you take your money in undamaged mixed denomination US$ notes issued post 1993. Travellers cheques are difficult to change. Armenia: Visas are not required for EU nationals, US & UK citizens. Other nationalities should consult the relevant consulate. Nothing compulsory but we recommend protection against malaria, typhoid, tetanus, infectious hepatitis and polio. Consult your travel clinic for latest advice on different prophylaxis available against malaria. Please check the latest requirements with your travel clinic or doctor prior to departure. The above is not an exhaustive list. Further information regarding vaccinations and travel health advice can be found by following the NHS and NaTHNaC links at Explore Travel Health and from your local healthcare provider. Visa and vaccination requirements are subject to change and should be confirmed by you before travelling. 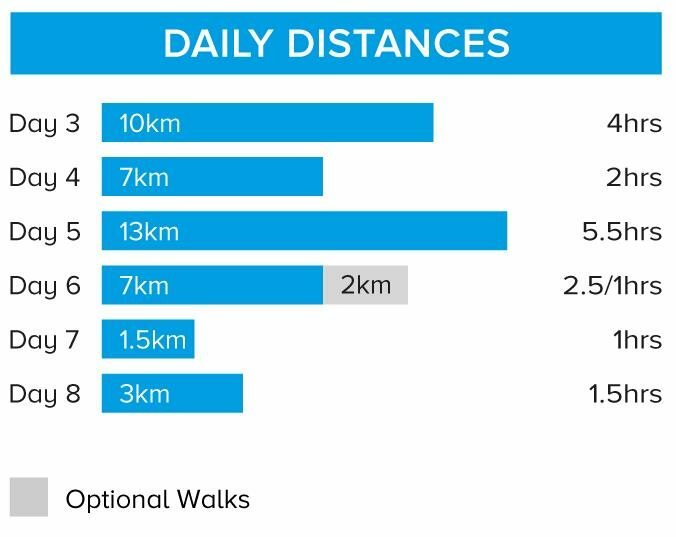 Walks on 6 days for between 1 to 5.5 hours each day.